Dear Readers, Students and Members of Planetary Society today 17 October we celebrate 15th Anniversary of formation of our organization . On this day 15byeare ago on 17 October 2003 Planetary Society was born as legal person. As Tribute Remembering Honorable former Prime Minister of India Shri Atal Bihari Vajpayee announcement of Indian Mission to Moon on Independence Day 15 Aug 2003 . We Present following Video Courtesy Govt Of India Source. 49th Birth Anniversary of ISRO - Manned Mission 2022 - Thanks P.M.
49 Birthday ISRO - India'S Manned Mission by 2022 - Thanks P.M. Modiji:Dear Friends/Students wish all Happy Independce Day. However we feel sad that most of you didn't remember ISRO in your wishes and things didn't change much in last 9years reg. Access to Space Science outreach/Awareness is Prog.Because today 15 Aug is 49th Birth Anniversary of ISRO. http://www.ournewplanets.info/2009/08/indian-space-research-organisations.html?m=1 if you have time read my article written 9years ago on occasion of 40th Anniversary. So happy 9yrs ago or today PSI doing its duty. Hence need for a organisation which spread importance of "Space Science " we started "Planetary Society, India" in 2003 . Yes India needs large number of Planetariums, Science Communicators, Support to Organisations imparting space science awareness and education form relevant agencies. We thank honourable Prime Minister Narendra Modi for announcement of "Manned Mission" by 2022. Actually we expected this immediately after 104 Satellite Mission. So it's time now greater outreach program should be developed ..But in the recent we have seen the Govt agencies relying on theirs officers are planning such programs.Which are not fulfilling the task but just achieving some preset goals of serving some numbers. Hence without involving space based or amateur astronomy groups ..any outreach will not serve much purpose. Like 40th or 49th Anniversary of ISRO will be limited to a Post on web. on awareness aspwct lot is needed to be done . We definitely don't need to see what happens during such events or missions in USA . How KG to PG resources are build and spread involving large number of Organisations by NASA.And sometimes they provided opportunity to organisation outside USA to serve/reach out local communities in other countries. While remembering great scientists like Dr.Vikram Sarabhai, Homi J. Babha, Arvamudam, APJ Kalam, U.R.Rao, Satish Dawan, Kasturi Rangan and many others who are continuing the legacy in service of nation .We wish all Scientist's a Happy 49th Birthday Anniversary of ISRO. Last among Five Eclipses of YEAR 2018 will occur Tomorrow 11 August2018. It's Partial Solar Eclipse and not visible from India . Gist of Eclipses in Year 2018: Total Lunar Eclipse (31st Jan 2018) , Partial Solar Eclipse (16 February 2018), Partial Solar Eclipse (13 July 2018), Total Lunar Eclipse (on 27/28th July 2018) , Partial Solar Eclipse (on 11Aug). However among Five only two eclipses (Lunar) were visible from India this year. Whereas 11Aug Partial Solar Eclipse similar to other Solar Eclipses of 2018 will not be visible in India . What are timings of this Eclipse as per Indian Standard Time (IST)? If it’s not visible in India which places across world is this visible? The Partial Solar eclipse on 11 Aug 2018 starts at 1.32pm IST Noon to 5.00pm IST as Per Indian Standard Timing (IST) but it’s visible only in the region covering northernmost Canada, Greenland, Iceland, northernmost tip of British Isles, most of Scandanavia, Svalbard, most of Russia, most of Kazakhstan, most of Kyrgyzstan, Mongolia, most of China. Is 11 Aug 2018 visible in Total anywhere on Earth? This Eclipse is Partial Solar Eclipse and Hence only Eclipse in Partial Phases is visible in the places mentioned above. When was Last Solar Eclipse and when is Next Solar Eclipse visible in India will Occur ? The last Solar Eclipse visible in India occurred on 9 March 2016 Which was Partial Solar Eclipse. The Next Solar Eclipse visible in India will occur on 26 Dec 2019 which again will be visible partially across India . Explain in common man language How and Why 11Aug Eclipse is not visible In India ? Solar Eclipse occurs when Moon comes between Earth And Sun such a way that ..shadow of Moon falls on Earth.. But Moon Shadow during solar eclipse will not fall at all places at a time on Earth..as Moon,Earth are Moving across Sun..so would the shadow of Moon..travels across face of earth from point a to point b. Hence India is not in the path of Moon shadow on 11 Aug 2018 so Eclipse is not visible here. As per the International Meteor Organization (IMO) this meteor shower peak is expected on the night of 13th/14th December 2017 with maximum of up to 120 Meteors per hour to be visible from clear dark skies. In 2016 Due to Moon meteors were outshined by Moonshine hence was not appreciated. Whereas 2017 in spite presence of Crescent Moon will not mar the event. 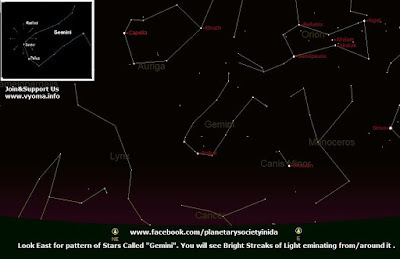 Why/How Locate Gemini – What you will see? – the Twins (Pattern of Stars)? Why Wait till 9pm? 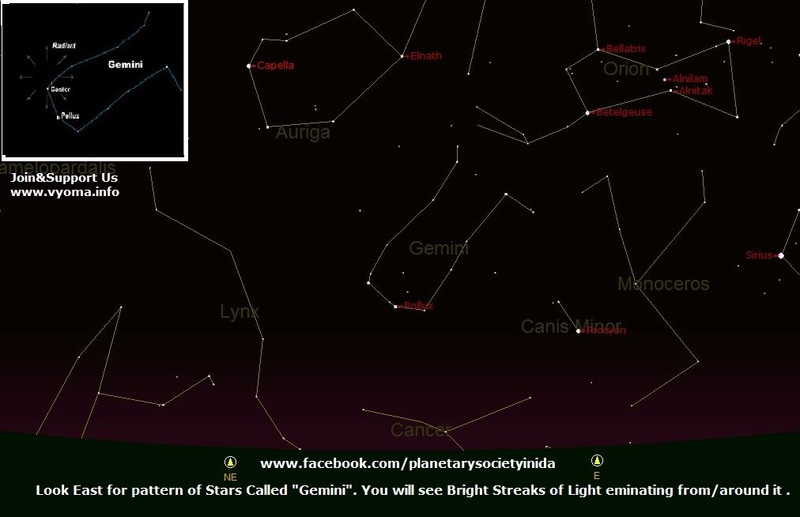 3 hours after Sunset from 10pm onwards looking between North East and East Direction one can locate Gemini Constellation (two bright Stars parallel to each other – in the pattern of Stars appearing/known since ages as Twins). It would seem as if these bright streaks of light are emanating near from star called Castor in Gemini constellation where the radiant of this meteor shower lies. Telescopes/Binoculars are not required to see Meteor Showers. How many meteors can be seen in an Hour? Depending on observer’s location and skies above, many tens of meteors per hour will be visible with highest rates reaching up to a max of 120 ZHR (Meteors per Hour) on 13th/14th December, 2017. Directions – Time – Evening, Midnight & Morning – till 17th Dec – Best Time to See: People can observe this meteor shower by looking North East and East Direction from 10.00 p.m. onwards, while they are visible near to mid of sky by the time it is Midnight whereas early Morning walkers can see meteors in the western sky in the morning before Sunrise. However 2 a.m. in the Night is best time to observe the meteors. 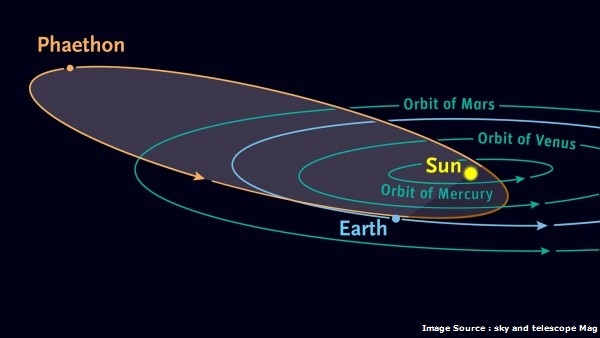 Parent Body (3200 Phaethon)of the Meteor Shower – to pass by earth on 16 Dec 2017 : Source of Geminid Meteor Shower particles Asteroid named “3200 Phaethon” moving at speed of 31 Km/Sec will pass by earth at distance of 0.068 A.U. (i.e.1,01,72,655 km) on 16 Dec 2017. The next time it will pass by earth is in year 2026 Oct 7 at 0.36 a.u. ( 5,38,55,233 km). In spite of its close pass by this object is not expected to hit Earth anywhere in distant . Geminids Meteor Shower: A meteor is a shooting star (layman’s Language), space dust/debris about the size of a grain of sand or more. The dust hits the earth’s atmosphere and burns up into a blaze of light. When greater number of meteors are visible on regular scale (mostly annually) in one part of sky due to a parent body then it’s referred as Meteor Shower. Where does space dust come from? Comets and asteroids pass through our solar system. During such pass comets/asteroids leave their debris i.e. clouds of Dust particles behind them. When earth crosses through these dust clouds specks of particles hit Earth's atmosphere at greater velocity and disintegrate into a bright flash of lights — meteors! 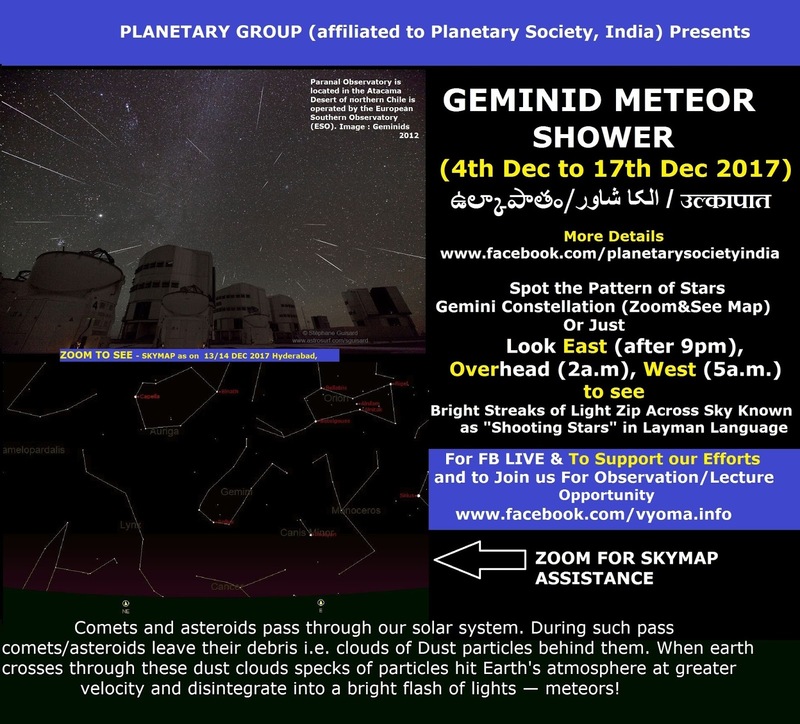 Specialty of Geminids Meteor Shower: The Geminids are one of the most popular annual meteor showers occurring visible from India apart from more than dozen such meteor showers. While most meteor showers come from comets, Geminids has a its origin from an Asteroid—a near-Earth object named 3200 Phaethon. Asteroids don't normally spew dust/particles like comets into space. However it is believed 3200 Phaethon its once extinct comet. Presently most of the experts call it “Rock Comet”. 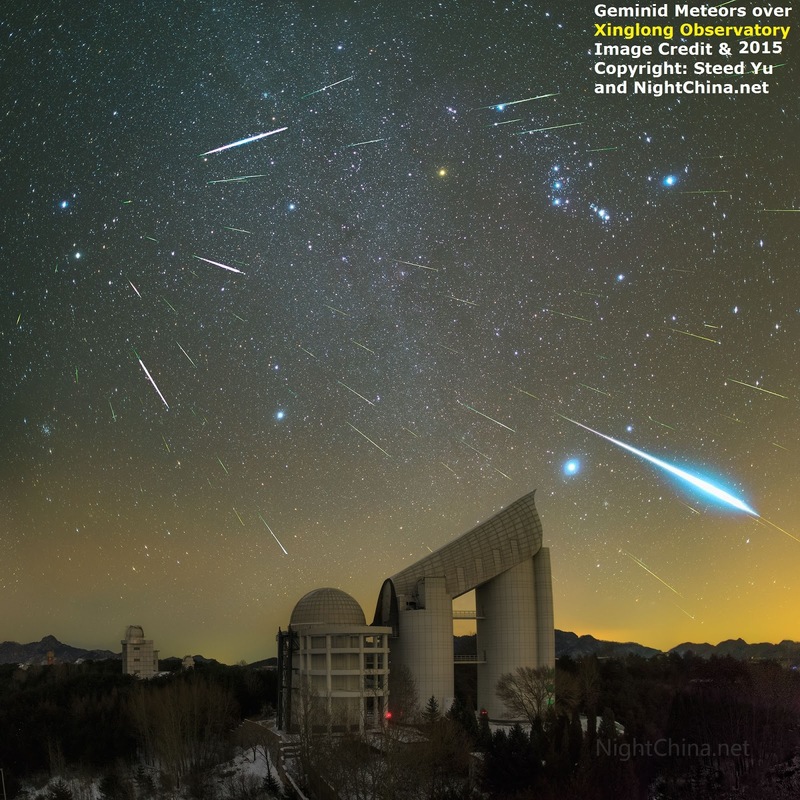 Asteroid 3200 Phaethon the parent body of Geminids Meteor showers is Potentially Hazardous Asteroid (PHA) : As of now Earth is passing through a stream of debris from extinct comet now Asteroid 3200 Phaethon, which is source of the annual Geminids meteor shower. On 10th December, 2007 it flew past Earth at a distance of about 0.12(1,79,51,744 km) away. In its next closest approach it passed by 0.4 A.U. ( 5,98,39,148 km ) on 29th September 2016. Dear readers/friends and Members of PSI .. Watch Today HMTV Telugu Television Channel from 3p.m. to 4 p.m. on 22 Sept 2017: Discussion on End of World. 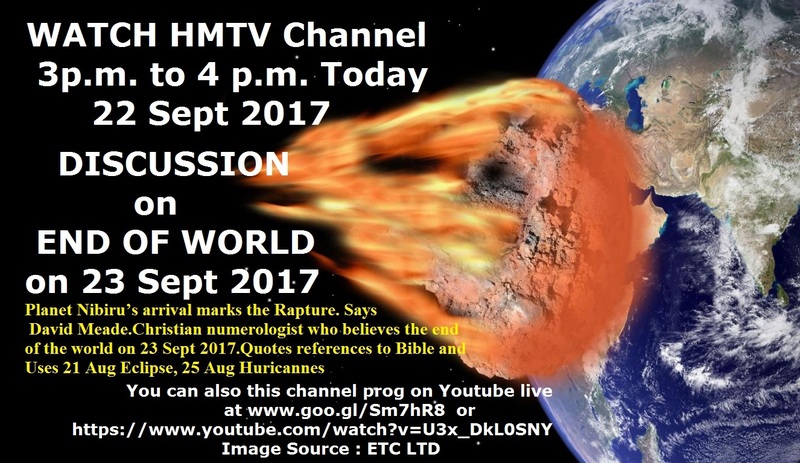 David Meade a Christian Numerologist says Nibiru Planet would hit earth marking "End of World" on 23 Sept 2017 he quotes the references to Bible ..Rapture, Revelation etc.. importantly uses recent Solar Eclipse on 21 Aug in America, 25 Aug Hurricanes. You can watch this channel online https://goo.gl/Sm7hR or https://www.youtube.com/watch?v=U3x_DkL0SNY. First and Last Eclipse visible in 2017 from entire India will occur on 7th August 2017. This eclipse is a Partial Lunar Eclipse. Across the world this eclipse will be visible in the region covering Western Pacific Ocean, Oceania, Australasia, Asia, Africa, Europe and Antarctica.This Eclipse is visible from India. The next Lunar Eclipse will occur on 31st Jan 2018 which is Total Lunar Eclipse and visible from Entire India. Last lunar Eclipse visible from Entire India occurred on 4th April 2015. Whereas Lunar Eclipse on September 2015 was visible from few places in Gujarat & Rajasthan only. All in the last Lunar Eclipse visible from India occurred in 2015. Further there is a Total Solar Eclipse on 21 August 2017. However this Eclipse is not visible from India. Whereas People in India have to wait till year 2019 to Observe Solar Eclipse. The Last Solar Eclipse visible from India was in 2016 March. Timings of Eclipse in Indian standard Time & Date: Eclipse in various phases begins at 9.18p.m. on 7th August 2017 and Ends at 2.23 a.m. on 8th August 2017. The noticeable Umbral phase begins at 10.52p.m. and Ends at 00.49 a.m. In other words: Though astronomically speaking Eclipse begins at 9.18 p.m. with moon entering lighter Shadow of Earth. People can noticeably witness darkening (or leaving) of Moon’s disk by Earth Shadow between 10.52 p.m to 00.49 a.m on 7th/8th August 2017.